Dynamite Comics’ Flash Gordon miniseries by writer Jeff Parker, artist Evan “Doc” Shaner, and colorist Jordie Bellaire was one of The A.V. Club’s Best Comics of 2014, and the creative team has reunited to create the best miniseries of DC’s Convergence event. Their work on Convergence: Shazam is pure retro fun featuring the Marvel Family, capturing all the heart and optimism that made Captain Marvel and friends some of the most popular superheroes of the Golden Age. 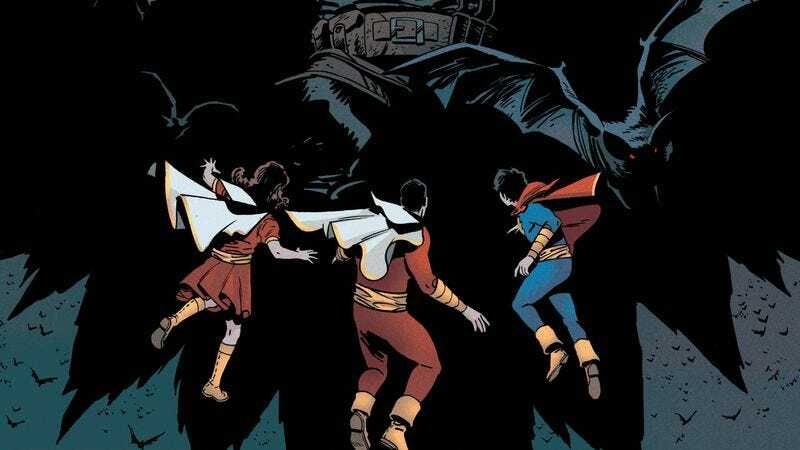 The first issue of the miniseries was all about bringing hope to the people of Fawcett City, but next week’s Convergence: Shazam ramps up the superhero action as the Marvel Family encounters the Victorian-era Batman of DC’s Gotham By Gaslight, giving the art team the opportunity to show what they can do with a darker character and environment. And what they do is gorgeous. Shaner’s design work for Victorian Gotham is lush and eye-catching, and the splash page of Batman riding a zeppelin is an outstanding introduction to the alternate-universe version of the Dark Knight. Shaner also draws wonderfully expressive characters, as evidenced by the two-page splash of Billy Batson and Captain Marvel conversing inside a bolt of magical lightning. Bellaire’s palette pops against the dark sky of Gotham, and the bright colors of the Marvel Family, Bulletman, and Bulletgirl accentuate that they are not a part of this world. Shaner and Bellaire’s sleek work intensifies Jeff Parker’s script, and judging by this preview, Convergence: Shazam is going to maintain its high level of quality up until the end.